ILLINOIS CONTINUES TO PROMOTE LIFE SCIENCE BUSINESS OPPORTUNITIES IN EUROPE. The Life Sciences sector has been identified as a high potential cluster in the 2014 Illinois Economic Development Plan. Illinois is already home to several of the world’s top life science companies, including; Abbott, AbbVie, Astellas, Baxter and Takeda. It is one of the top biotech States in the USA, where the industry is estimated to be worth $98.6 billion while in the more traditional medical devices sector, Illinois had the 2nd largest gain in the USA for medical device establishments. A key part of the Economic Development Plan is to assist companies to develop new routes to export. While the United States is the world’s largest market for healthcare, its companies need to also look abroad to guarantee continued growth in this sector. In the medtech industry for example, the United States has annual sales of $139 billion. 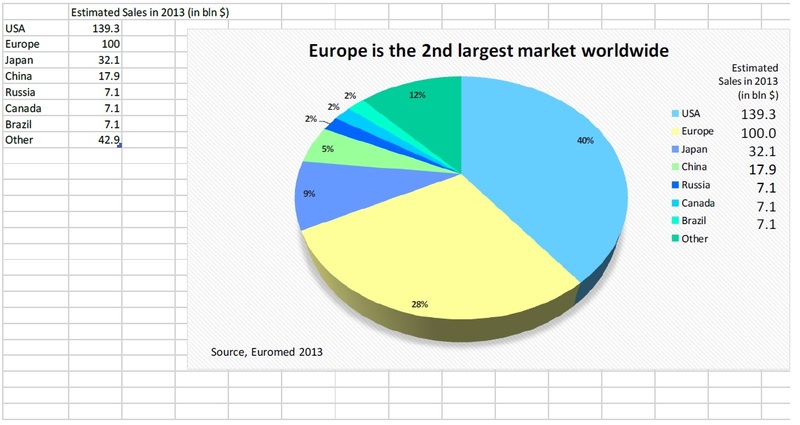 Europe, with annual sales of over $100 billion is by far the second largest market. More importantly 65% of Medtech imports coming into Europe come from the United States so for export opportunities, it is a key market to target. Two recently completed key Trade Missions allowed Illinois companies to develop business opportunities and new markets in Europe. The first allowed nine Illinois bio companies and organisations attend the prestigious Bioeurope Conference www.edpgroup.com/bioeurope and exhbition in Frankfurt, Germany, which is the largest Biotech event in Europe with an excellent partnering platform run by EDP partnering. Using this platform effectively meant that a total of 167 focused meetings were held between the Illinois companies and European partners over the three days of the event. The feedback was extremely positive and encouraging to the point that all companies that attended would like to attend a similar event in the future.Overall the companies collectively estimate that in excess of $4million in new business will arise from their participation at this event over the next two years. Medica, the second event on the Illinois life sciences calendar took place a week after Bioeurope. Medica is held annually in Düsseldorf, Germany and is the largest and most international world trade fair for medical devices and diagnostics. It is a particularly good show for meeting distributers, and is extremely international with 84,000 of the 130,000 visitors coming from abroad. Seven Illinois companies exhibited on a shared Illinois stand which was busy through-out the 4 days of the show. All companies were extremely happy with both the quality and volume of the leads they obtained and estimate several million in new business arising from the promising meetings had with almost 60 new potential international distributers during the exhibition. SynChem, Inc. 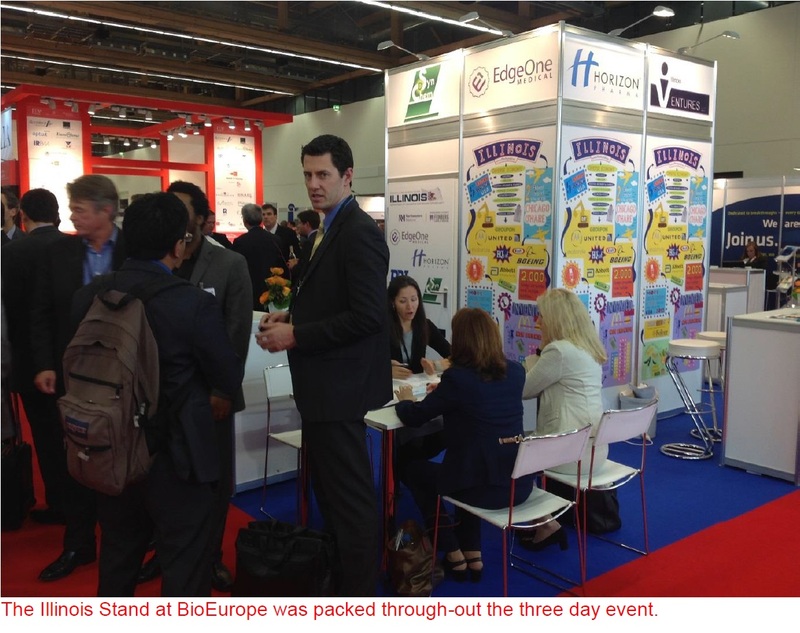 Representatives Joined in Illinois Biotech Delegate To BioEurope 2014 in Frankfurt. 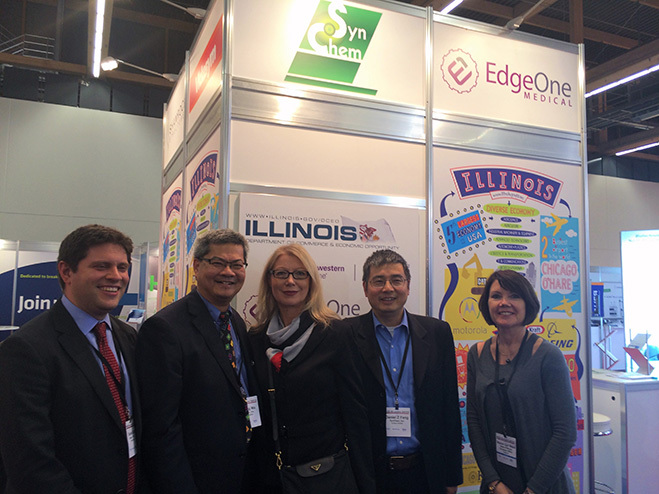 As members of Illinois Biotech Delegate Dr. W. Paul Mar and Daniel Fang from SynChem joined the four days BioEurope 2014 in Frankfurt, Germany. As Europe biggest biotechnology partnering conference there are more than 3,200 participants from 1,772 companies. SynChem’s representatives meet with more than 20 potential collaborators to discuss about its own ADC linker technology and also explore potential licensing its patented technology.